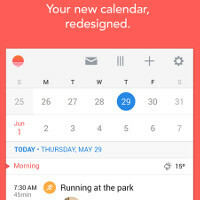 Sunrise is a new calendar app for that works both with Google Calendar, and crosses over to iCloud, too. It is simple, light and efficient, what Google's Calendar should be, if it wasn't put on the backburner by the busy folks over in Mountain View. And so, whether you are coming from Apple's iCloud calendar, or unsatisfied with Google's solution, Sunrise is worth giving a shot, be it only to see what iPhone users have been clamoring about since the app was released on the iOS platform last month. While the choice of widgets might leave something to be desired, and the developers are hard at work bringing Exchange support, as well as a tablet-oriented UI, Sunrise still shines with most bells and whistles you'd expect from a great calendar app, plus a simple to use, polished interface. Oh, yes, a great app for iOS. Simply beautiful app, downloading now, thanks PA. It's a nice calendar, but uninstalled it. Doesn't support colored events (takes on the color of the Google calendar) and I color code my events. Also the widget is ugly and can't make any changes to its looks. That was my experience too. It looks good at first, but basically it is a POS. Can it schedule every other week on Thursday at 10 AM? Not every second Thursday.